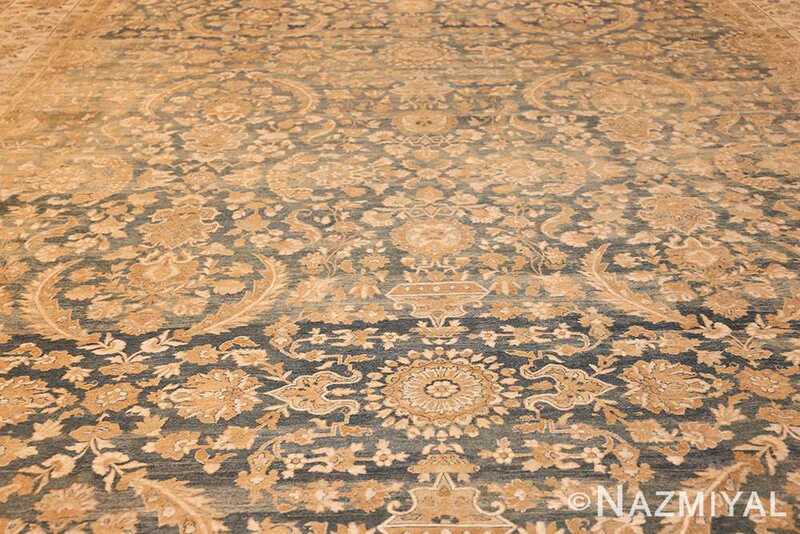 Beautiful Antique Extra Large Oversized Light Blue Antique Persian Kerman Rug, Country of Origin: Persia, Circa Date: 1920 – This beautiful antique Persian Kerman carpet is a magnificently luminous and bright artistic rug. A lovely light and airy abrashed blue color forms the interior backdrop that occupies most of the surface area of the inner field. 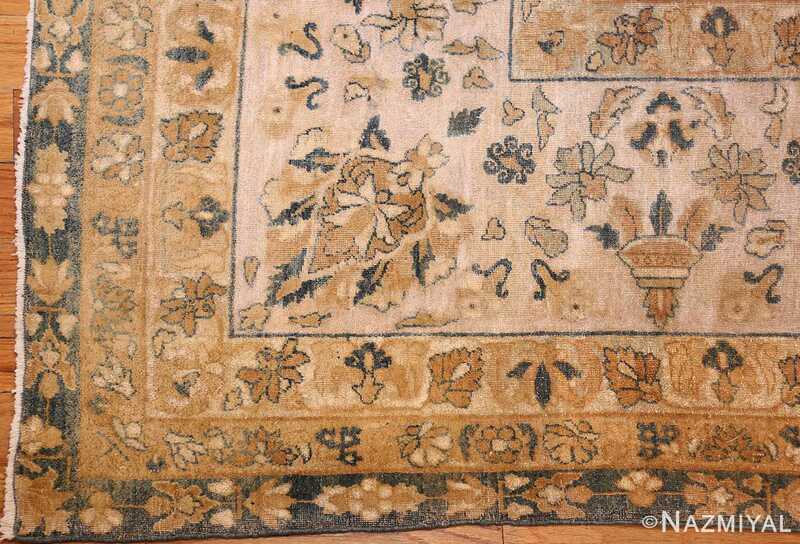 Against the light blue background color, we see beautiful and elegant floral and vase designs in soft hues of tan, yellow, and cream. 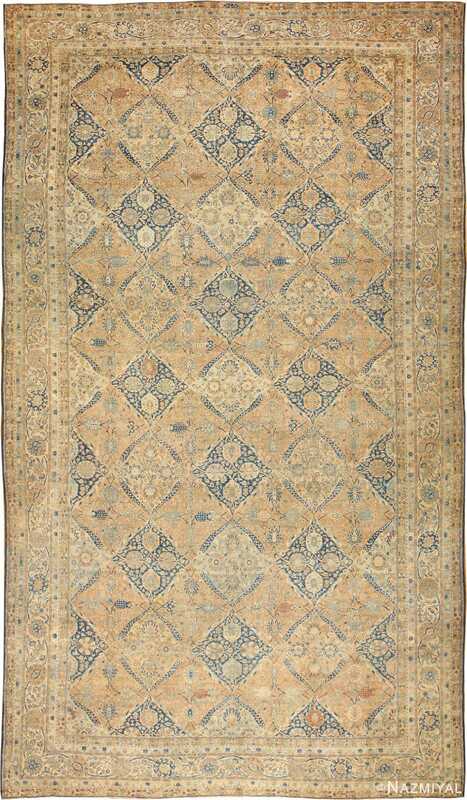 These gentle, more vibrant colors comprise most of the inlaid design patterns of the antique carpet. The contrast and juxtaposition that is created between the light blue field and the yellow’ish floral designs create piece that could only be described as an extremely decorative and happy rug. The design work itself suggests floral, pottery, and tableware inspired elements, with simplicity and elegance fused together to deliver a charming, cozy aesthetic. The patterns weave around and meander between each other. 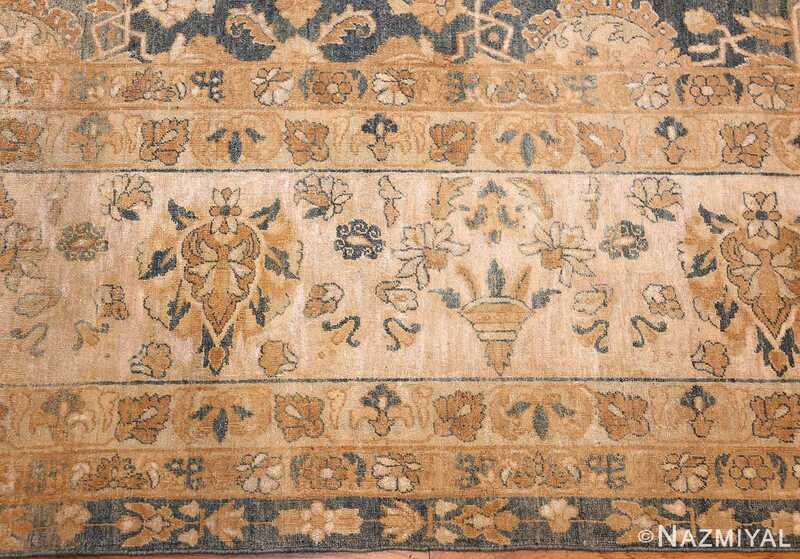 This gives rise to unique rug design motifs that are given added depth and dimension by the interplay of the colors that comprise them. 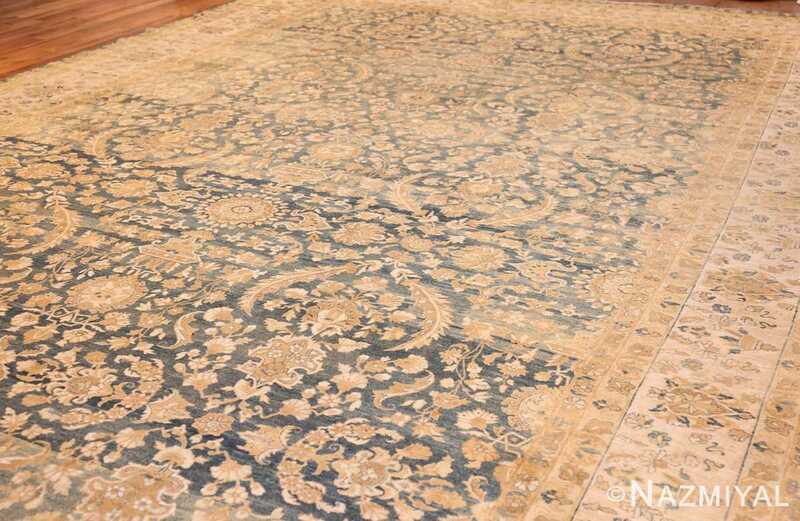 Each of the seven different layers, within this classy oversized light blue antique Persian Kerman rug, also possess their own unique character. 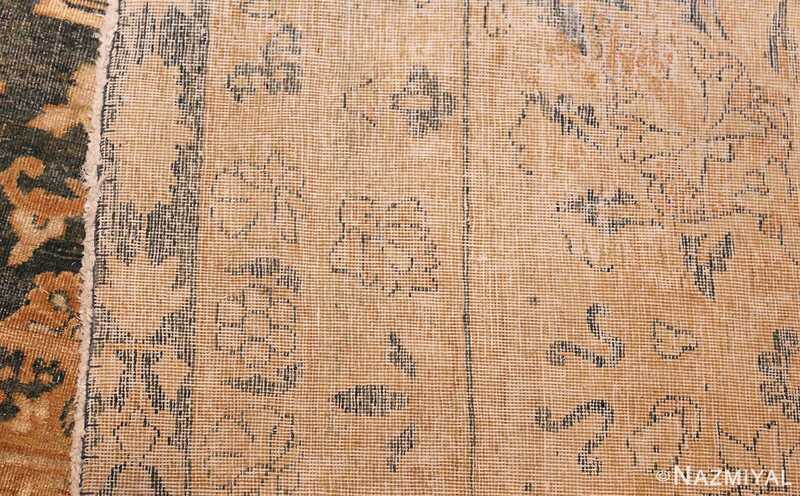 This is seen in both in color palette and in the design work, which varies both in size and in symmetry. 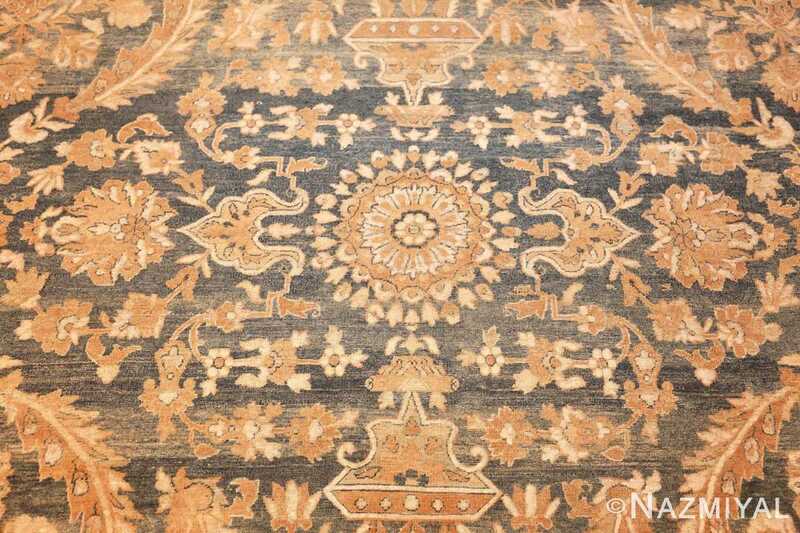 This layered variance contributes to an overall progression from the simplicity of the border areas to the increasing elegance and complexity of the design work found in the inner regions of this magnificent antique Persian rug. 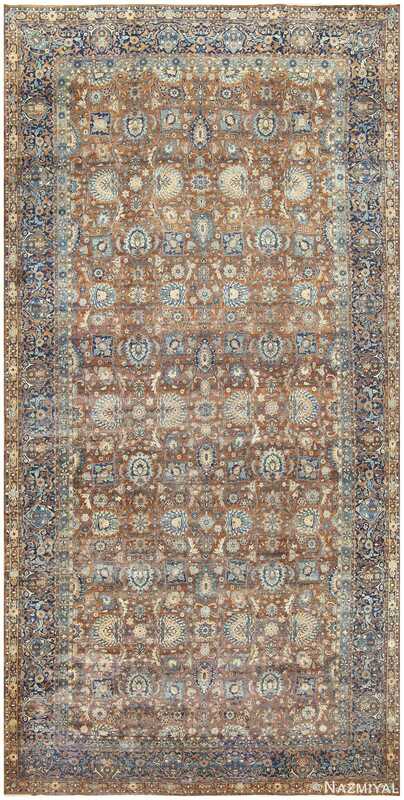 Rounding out the look of this breathtaking and happy oversized light blue antique Persian Kerman rug, is a touch of patina that only time can make. A subtle abrashed color variation sweeps evenly across certain segments of this antique oversize carpet, slightly altering the color hues here and there for a more rustic, antique, and homely look. This is one spectacular antique Oriental rug. It is sure to brighten up any space and interior decor. 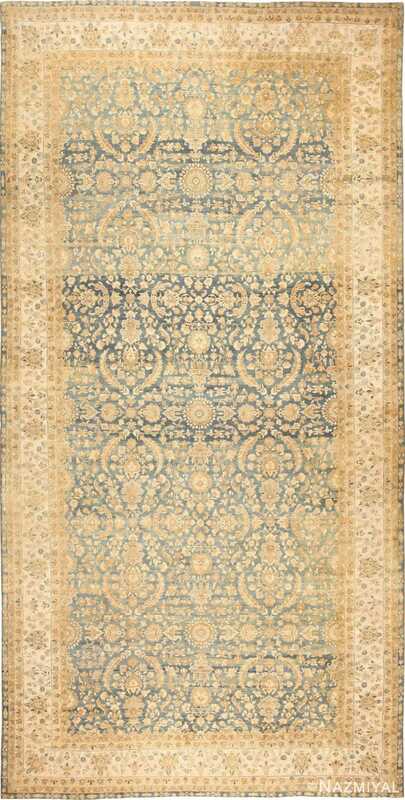 Regardless of where it is placed, this piece is sure to offer a magnificent backdrop to any room or home. 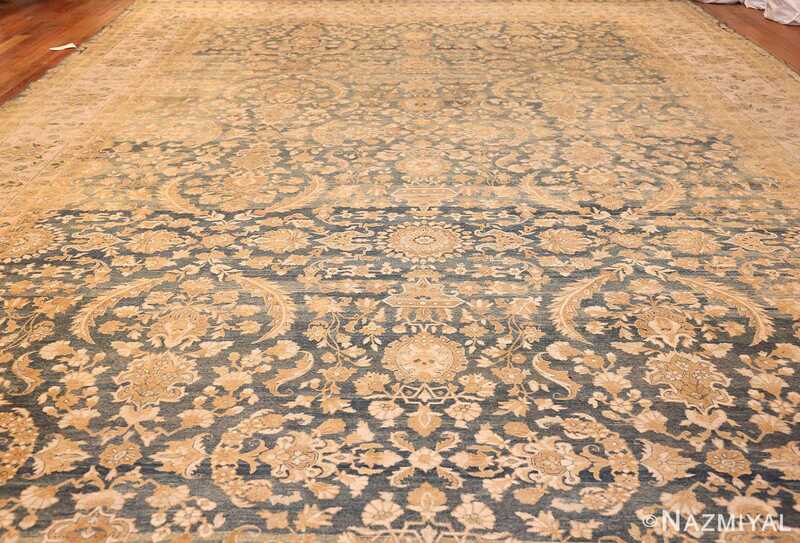 A lush oriental pattern of allover floral designs and vines spreads gracefully throughout the expansive field of the above incomparably elegant antique Oriental Kerman carpet from Persia.